Björk DJ Set. Photo by Roger Ho. Certainly one of the festival's most rousing headlining acts was Björk's eight-room exhibition of artworks in VR. The exhibition features works like Black Lake, a 10-minute music video directed by filmmaker Andrew Thomas Huang, and Stonemilker VR, another collaboration with Huang that transports viewers to a private beach performance of the first song off Björk's Vulnicura album. The exhibit also features Notget, directed by Warren Du Preez and Nick Thornton Jones, where viewers witness Björk being transformed into a digital moth goddess right before their eyes. The strength of Björk Digital was that the mechanics and the gear needed to transform to another world were all there for you to personalize to your own experience. Not only was the it expressly individual, it was profoundly personal as each participant could sway and swing with the singing goddess. The installation confirms that Björk, with all of her Björkiness, was born for VR. Musica Universalis by United Visual Artists. Photo by Theo Civitello. London-based multidisciplinary studio United Visual Artists exhibited a new spatial instrument called Musica Universalis, that looked at the reverberation of far away objects in our solar system. The stark movements of the lights orbiting around the glowing moons felt like a nod to kinetic pioneer Panagiotis "Takis" Vassilakis, transporting us into the fourth dimension. The United Visual Artists team are veterans amongst this eclectic group of artists. Since its conception in 2003, the studio has been producing artworks both small and large, that explore our relationship to technology and the tension between real and synthesized experiences. SHIRO by Nonotak. Photo by Theo Civitello. This is NONOTAK's second time in Houston for Day for Night. This year, they presented a new, site-specific version of their SHIRO installation, which doubles as an artwork and live performance. SHIRO is made up of two intersecting translucent planes that the artists send patterns of white light across in waves. Much in the vein of minimalism, Frank Stella, and Dan Flavin, NONOTAK use repetition and iteration to create their light compositions. The conceptual art duo works primarily in performance-based installations that incorporate light and sound to create immersive environments that elevate and distort our perceptions of reality. Ghostbeast by Shoplifter. Photo by Elisabet Davidsdottir. Icelandic artist Shoplifter, a.k.a., Hrafnhildur Arnardottir, is probably best known for the alluring fluorescent sculptures and wall murals that she constructs from synthetic hair extensions. Her Ghostbeast sculpture at Day For Night maintains a similar aesthetic to past works like Nervescape IV. The installation occupied a large cage that the artist turned into an interactive sculpture using synthetic fur. The sculpture feeds on sound and light and grows as time passes. Shoplifter's work draws inspiration from pop culture, Scandinavian textile art, and graffiti. Outlines by Tundra. Photo by Theo Civitello. Tundra's team of musicians, sound engineers, programmers, and visual artists reassembled their dazzling Outlines installation for this year's festivities. 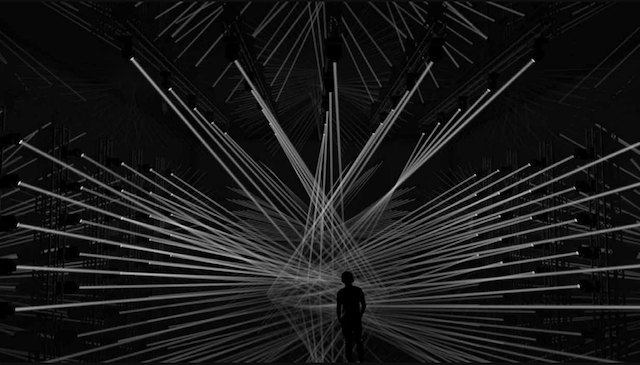 Comprised of 260 red laser beams, the installation generates a gigantic grid of choreographed light patterns and movements with an ominous soundscape. The St. Petersburg-based collective specializes in creating dream-like environments that explore the interaction between audio visual stimulus and human emotion. Damien Echols in the Sigil Room. Photo by Sara Strick. Damien Echols spent 18 years on death row after being wrongfully convicted of murder in 1994. Since his release in 2011, Echols has cultivated a performance and visual arts practice that stems from his fascination with ceremonial Magick and tarot card readings. Echols creates glyphs, sigils, and symbols that are designed to communicate directly to our subconscious. The artist collaborated with Day For Night's curator, Alex Czetwertynski, to create the Sigil Room, an immersive installation room of light symbols. In his performance, the artist leads the crowd through the process of creating personalized glyphs. He says, "We have human teachers but we eventually outgrow the human and it's the Magick art itself that becomes our teacher. It leads us, it guides us, it teaches us. It parts the ways to the next phase of self-actualization." He instructs the gathered crowd to close their eyes and focus on their heart chakra. "For this exercise, the intent that we'll use is 'May the light protect, guide, and illuminate me on my journey through life and on a path of high Magick. We're asking that to lead us to become better people to become more knowledgeable people to enter the next stage of our development.'" Stream by Ezra Miller. Photo by Ismael Quintanilla. The youngest artist on the docket this year is 20-year-old Ezra Miller, a creative coder and internet artist that creates realtime generative animations using WebGL technology. His Stream installation projected a live feed of the main stage onto a wall that he then manipulated in real time with custom graphics and distortions. Miller says, "The main thing I wanted was to get a balance between moments in total abstraction and total pure color and generative random stuff." Within this mashup of video and live graphics, Miller creates a new artwork that is entirely his own and of the moment. Miller's work shows a fascination with digital reflections, refractions, patterns, and feedback loops. Michael Fullman is the creative director of VT Pro Design, one of the artist studios featured in The Creators Project's Future Forward program. Fullman created an elaborate chasm of intersecting lights in a new installation at Day For Night, Bardo. This generative spatial experience is made from hundreds of stage lights that are all hooked up to an arched metal frame. Each fixture shoots intersecting beams of light into the center of the installation space, creating an illuminated vortex that encourages viewers to interact with the piece and one another. As the viewer moves around the installation, the lights produce an ever-changing pattern and structure depending on the viewer's position. Bardo is a play on purgatory or the Buddhist idea of the transitional state. It is meant to trap the participant in an internal journey through the exploration of lights. To learn more about the Day for Night Festival click here.